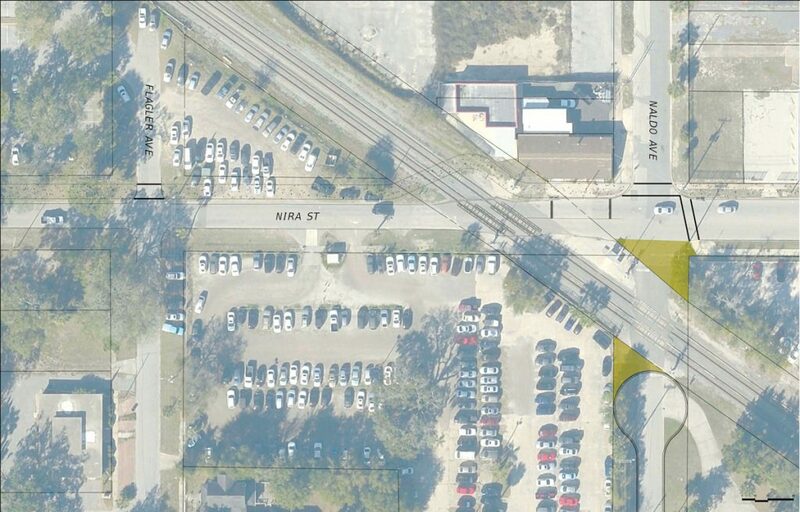 City plans to close two railroad crossings for pedestrian path - The Resident Community News Group, Inc. | The Resident Community News Group, Inc.
FDOT map illustrating the flow of traffic after railroad crossings at Naldo Avenue and Gary Street are closed so that a pedestrian and bicycle path along Nira Street may be built in San Marco. City officials came one step closer to realizing their dream of building a multi-use path encircling North San Marco when the Florida Department of Transportation held a two-hour public meeting to discuss construction of a new pedestrian railroad crossing as well as closing two vehicular railroad crossings in San Marco. The meeting was held in San Marco’s Preservation Hall Jan. 23. The multi-use path, which is meant to create a safe avenue of transport for both bicyclists and pedestrians, will comprise a large loop connecting the Southbank Riverwalk, soon-to-be-built The District-Life Well Lived riverfront development, Nira Street and Children’s Way with a multi-use bridge connecting San Marco with Riverside. FDOT is currently constructing the multi-use bridge next to the Fuller Warren Bridge across the St. Johns River. In order to build the new crossing, which will be used exclusively by pedestrians and bicyclists, two existing vehicular crossings – at Gary Street and Naldo Avenue – will be closed per mandate of FEC (Florida East Coast Railway), said Rob Stapleton, freight and rail planner for FDOT. Although there was no verbal presentation, Stapleton, Kyle Coffman, District 2 rail administrator, and Laura Miller, rail signal safety program engineer, of FDOT joined the City’s Director of Public Works John Pappas, Project Engineer Kelsey Cox, and District 5 City Councilwoman Lori Boyer in answering questions about the multi-use path project and railroad closings. “The City applied to open a pedestrian pathway across the tracks and the FEC railway requires that if you open a crossing, be it vehicle or pedestrian, that you close two crossings,” Stapleton said. “To have two crossings that close together is redundant and not safe. The federal government back in 1991 told all the states it wanted them to reduce the number of public crossings by 25 percent to help reduce the amount of risk that’s out there. Other railroads can require more or less. CSX requires three crossings be closed for the one opening,” he said. The crossing at Gary Street has already been closed due to construction on FDOT’s Overland Bridge project and will remain so permanently, Stapleton said. To close the Naldo Crossing will require that the south portion of the street become a dead end near AshCo’s planned Union Hall project. The north end of Naldo Avenue will remain open with the multi-use path running across its intersection with Nira Street, he said. If there is no reason to “revisit” the project, the next step is to have FDOT put together a “stipulation of parties,” an agreement which will specify how much things cost and who is responsible for the work. Once that agreement has been signed by the City, it will have 60 months to complete the project, Stapleton said. “I’m sure the closures will happen really soon, but how long it will take to get the pedestrian pathway across, I don’t know. They have five years to finish it,” Stapleton said. Not everyone was happy about the decision to close Naldo Avenue. City map showing the closure of the railroad crossing at Naldo Avenue and the new pedestrian crossing on Nira Street so that a new multi-use path can be built circling North San Marco and connecting with The District property and the Southbank Riverwalk. “I can tell you they approached us about this previously and it’s a big safety problem,” said John Parker, business manager for Sheet Metal Workers Local 435 Land Company, which previously owned Union Hall. “There are a lot of people that congregate at the end of that street and if there is an emergency and they close the crossing, there is only one way in and one way out. There is no parking for the houses, apartment complex or the duplex that is next to Union Hall. They park on the street. It’s a problem to even think of getting an emergency vehicle like a fire truck or an ambulance down the road if it is blocked and there is no way in or out. Echoing Parker’s safety concerns were Edward Ashurian and members of his family, who own the Union Hall and San Marco Train Station properties adjacent to the closure site. “I’m very concerned for all the residents that live on Naldo Avenue because San Marco is historically an area that floods, and I’m worried people won’t be able to leave the area safely, especially if they need hospital service. It’s just going to be a real difficult thing for the community. I’m hoping we can fight this,” said Ashurian’s daughter, Tiffany. Ashurian agreed. “I’m mainly concerned about the safety of those who live on Naldo north of Cedar Street. We have flooding every time it rains. The highest point I’ve ever seen that flooded was more than three feet. No emergency vehicle can get to Naldo any other way than to go through that intersection,” he said, adding he also did not think seven days was enough notice to give to adjacent property owners. Dr. Travis von Tobel of The Institute for Florida Pain Specialists also disagreed with the Naldo closing. “I have a couple of patients over there that are wheelchair bound so I can’t disclose names, but that road is the main road for them to get in and out. If ambulance accessibility is prevented, it will not be good,” he said. District 5 Councilwoman-elect LeAnna Cumber echoed her support of the closing. “If we want to get a quiet zone in San Marco, which I know is very important, this is one of the steps we need to take. If we want to have a multi-use path, we need to do this,” she said. “Closing Naldo is a major deal,” said Sandra Myers, a San Marco Place resident, “but if you go up to LaSalle and then over to Hendricks that way, it’s a little short cut from Panera. It’s easy enough to move over one street,” she said. Pappas said the City’s goal is to close the crossing at Naldo Avenue. “That is our plan, and absolutely, the City wants to see it through,” he said.